“The Hunt” plays Monday through Thursday at Point and Eastgate Cinemas. Not rated, 1:52, three stars out of four. Even when things get very bad, the little Danish town in “The Hunt” seems so nice. It’s a place where everybody knows everybody, where folks walk to school and drop in unannounced in each other’s homes, where the pews are full on Christmas Eve. It’s in this bucolic little retreat that director Thomas Vinterberg (“The Celebration”) creates a modern-day “Crucible,” a frighteningly plausible examination of how suspicion can spread through otherwise decent people. 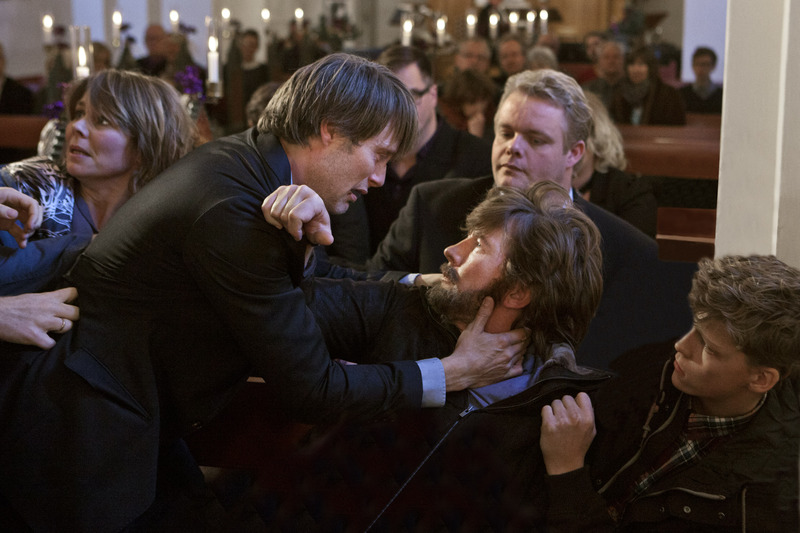 The focus of this paranoia is Lucas (Mads Mikkelsen), a new teacher at the local kindergarten. Lucas’ life is in a bit of a tailspin – he’s in a tug-of-war with his ex-wife over their son, and he had to take the kindergarten job for less pay after the primary school closed down. But he’s good with the kids, wrestling with the boys good-naturedly on the playground. Klara, the daughter of a close friend of Lucas’, has grown especially close to her new teacher, especially as her parents are fighting at home. One day, Klara impulsively kisses Lucas on the lips, and he gently rebukes her. She gives him a valentine, and he politely suggests that she give it to one of the boys in class instead. Stung, Klara tells another teacher, Grethe (Susse Wold) that Lucas exposed himself to her. The film presents this as one of those typical, momentary fits of anger that the child forgets about 10 minutes later. But Grethe takes it seriously – “The children don’t lie,” she says of her charges, making you wonder if her tenure as a kindergarten teacher could be measured in minutes rather than years. Grethe starts informing the other teachers and parents of Klara’s accusation, and the story grows as it spreads. A possible incident becomes a certain crime, one victim becomes several victims. And Lucas shows up at work one morning to find other teachers literally fleeing from him. 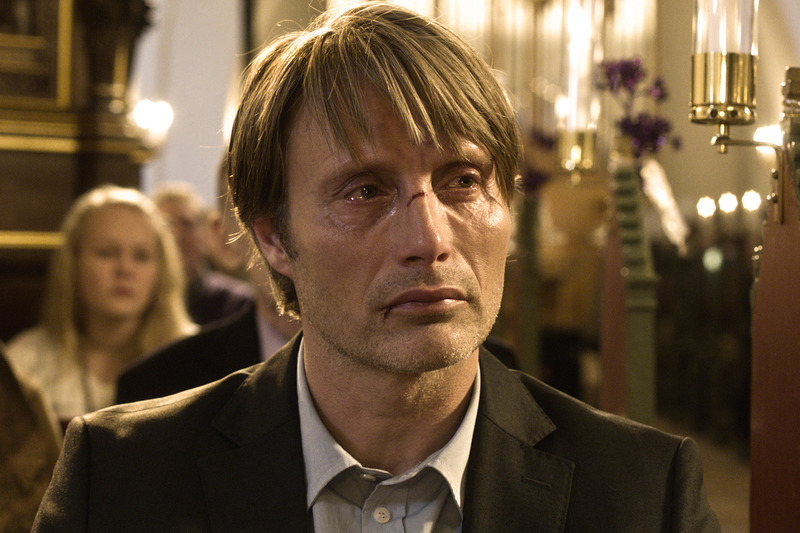 Mikkelsen effectively shows how a strong man is weakened by the force of public approbation, amazed that his protestations of innocence are ignored, stunned to become a pariah in the town. And Vinterberg is almost clinical in showing how suspicion grows and intensifies, fear building upon itself, distrust turning to hatred. The crusade against him only seems to grow stronger as Klara’s story looks flimsier; when Klara tries to recant again and again, the adults pat her on the head and assure her she’s just repressing the truth. Finally, the nightmare ends, but “The Hunt” ends with no vindication for Lucas, just a gradual realization that the strong-seeming community bonds that Lucas relied upon are really tissue-thin, easily ruptured by rumor and innuendo. “The Hunt’ is a hard movie to watch, but worth it.